On Dec. 26 a fatal crash unfolded on James L. Redman Pkwy. Thanks to the investigative measures of PCPD, the case is coming to a close. Plant City Police are using their detective work to set the stage for future cases. On Dec. 26, a driver of a red Chevrolet Colorado was traveling northbound on James L. Redman Parkway. Suddenly it veered west through a grass median that separated traffic and plowed into incoming southbound traffic. It struck a gray 1995 Ford Contour, then it deflected into a black 2016 Ford Focus. During the crash the Chevy rolled onto its right side where it finally came to a rest. The Contour also came to a stop in the roadway, but the Focus came to rest in a drainage ditch. The complex collision resulted in the death of Maria DeJesus-Rodriguez, 57, who was a passenger in the Contour. The driver of the Contour, Manuel Flores of Mulberry, had injuries as a result of the crash. 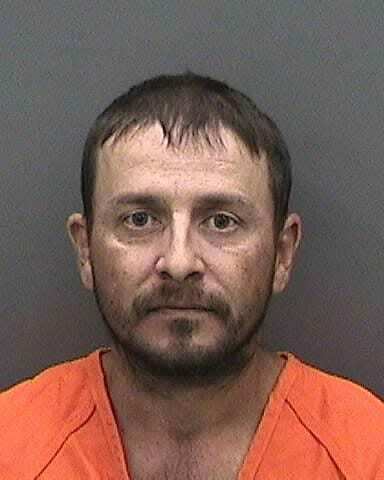 Bradley C. McTaggart, 38 of Seffner, was driving the Chevy and was later arrested and charged with one count of vehicular homicide for the death of DeJesus-Rodriguez and one count of reckless driving with serious bodily injury for the injuries sustained by Flores. When the traffic homicide team from PCPD arrived at the crash late in the evening of Dec. 26 they knew immediately something was different about the scene. The position of the cars, the debris and the skid marks didn’t add up for the story that was being told. PCPD spokesman Sgt. Al Van Duyne said the officers were told by eye-witnesses the path the vehicle took into incoming traffic. Officer Christian Lopez, a traffic homicide investigator, and his team comprised of Lopez, Officer Adam Heist, Officer Kyle Russell and Officer Jason Fowler began to pour into the investigation. Lopez was at the scene for six to eight hours, not leaving until approximately 2:30 a.m.
Rubber evaporates, denim or other clothing items imbedded in the asphalt can be picked up with a strong enough wind or soft rain or even other cars. The officers on this team have undergone intense training to be able to handle fatal crashes. There is a six week minimum training and then they go through another 240 hours of additional training split among three classes: basic traffic homicide, advanced crashes and reconstruction. There are a variety of other courses officers can take the time to go through, which means they could have “well over” 500 hours by the time they’re hitting the scene. Van Duyne said it’s important the public knows they have highly trained professionals at the scene. Breanne Williams. Sgt. Van Duyne with the $20,000 total station used by PCPD at accident scenes. Using a new total station, which Chief Duncan used PCPD’s annual budget to purchase for $20,000 in October, the team was able to record every single piece of debris at the scene. Essentially the officers walks around the crime scene and the machine follows their movement. Each piece of debris is logged and soon a full diagram of the incident is made. A program in the computer can use the math needed to seal up any error that could potentially stop the case before it begins. PCPD only had the machine for two weeks before it was first put into use on the accident on Sammonds Road. The older total machine it replaced was not automatic and required multiple officers to operate effectively. The old machine will be used for training and as a backup in case the need arises for both at the same time. The new machine has been utilized multiple times since then and despite the hefty chunk of change it took to get it, officers say they are ecstatic to have it. Lopez and his team created a file hundreds of pages thick of interviews, evidence at the scene, the background of the driver and other pieces of the story they discovered as the investigation continued. Breanne Williams. Diagrams are used to sketch out debris and to recreate the events during an accident. Lopez knows first hand the pain that comes with a case not being investigated to its fullest ability. His brother was in a motorcycle accident and was paralyzed as a result. Lopez said the investigators were more interested in writing citations than figuring out exactly what happened. He vowed then and there that would never be him, that every scene he goes to would get the greatest investigating he can provide. It’s been weeks since the night of the accident, but Lopez and his team still spend countless hours every week digging further and further into the story. They presented the full picture to a review board and it was officially picked up as a case. Once the warrant for McTaggart’s arrest was out, PCPD was there to send him to jail. Lopez said he was hiding and had no idea they were coming. Courtesy. McTaggart has a hearing scheduled for Feb. 15. McTaggart, a self-employed mechanic, has had his bond hearing and will soon have pretrial hearings. The first hearing is set Feb. 15 at 9 a.m. in Tampa. Its a three to six month process if McTaggart doesn’t accept a plea.